In stock -This product will ship today if ordered within the next 11 hours and 1 minutes. This gentle Jason Aloe Vera Body Wash cleanses with natural botanical surfactants and safely nourishes with Vitamin E and Pro-Vitamin B5. 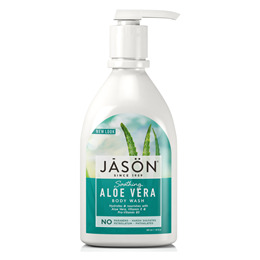 Jason`s natural blend of soothing Aloe Vera and Sunflower Seed Oil provides lipid relief to smooth and hydrate your skin. No parabens, sodium lauryl/laureth sulfates or phthalates. Aqua (Water), Cocamidopropyl Betaine, Sodium Lauryl Sulfoacetate, Aloe Barbadensis Leaf Juice*, Calendula Officinalis Flower Extract*, Chamomilla Recutita (Matricaria) Flower Extract*, Spirulina Maxima Extract, Helianthus Annuus (Sunflower) Seed Oil*, Prunus Armeniaca (Apricot) Kernel Oil, Allantoin, Citric Acid, Glycerin, Lauryl Glucoside, Panthenol, Sodium Chloride, Sodium PCA, Sodium Sulfate, Stearyl Citrate, Tocopheryl Acetate, Alcohol*, Benzyl Alcohol, Potassium Sorbate, Sodium Benzoate, Fragrance (Parfum). *Certified Organic Ingredient. Below are reviews of Jason Soothing Aloe Vera Body Wash - 887ml by bodykind customers. If you have tried this product we'd love to hear what you think so please leave a review. Lovely smell and lasts for ages. Nice in the shower or as bubble bath. 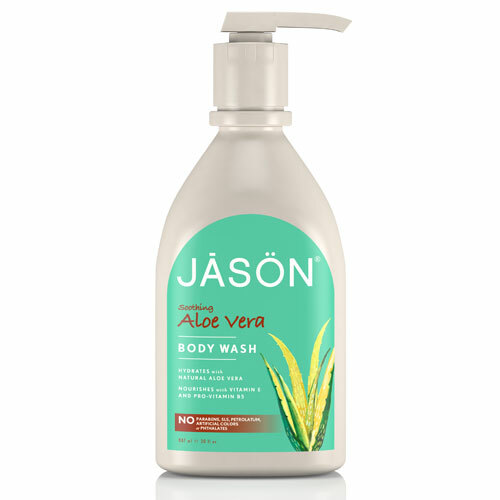 This gentle Jason Aloe Vera Body Wash cleanses with natural botanical surfactants and safely nourishes with Vitamin E and Pro-Vitamin B5.